Recently I bumped into one of the Tweets which redirected me to this post on SCN. Jason Cao from SAP has challenged the Xcelsius community to come up with their own Visualization. 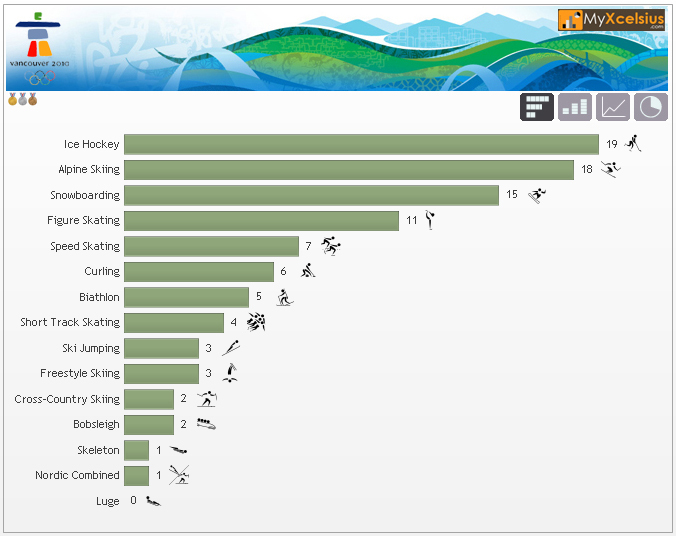 He provided a sample data of a community poll results in which users took a poll on “What is your favorite Winter Olympic sport to follow?”. Although the data was only sufficient for a single chart, it threw an interesting challenge at the Xcelsius developer community to make it look more interesting. Finally after 4 weeks, I got a breather from work to work on something interesting. However, I overlooked the deadline for submission and was late in submitting my version. Jason was kind enough to accept submissions after the deadline date, but to keep it fair the submissions made after the deadline will not be included in the competition but will be showcased on the challenge page. I browsed through all the approved visualizations and found very few interesting. The idea was to improvise the chart, not to build a whole new dashboard on the Vancouver Olympics. I liked the enthusiasm and interest that the community members showed to make their mark. The idea was to take the minimum data provided and make it look more interesting and intuitive. Here is what I came up with. Your comments, Suggestions and Criticism will be well received. Please use the comments section to shout it out. We all know that .xlf is the file extension for all Xcelsius source files. However, did you ever wonder what an XLF file is comprised of? How is it built behind the scenes? Here is an interesting post by Fernando Ferrer from Clear Peaks. According to Fernando, the XLF file is made out of 3 different files/folders. 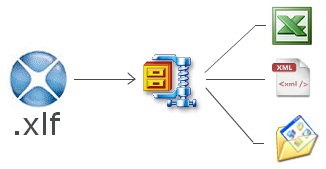 You can extract them by simply renaming the file extension from .xlf to .zip and extracting the same into a folder. Simulating Traffic Lights using Xcelsius. Literally! On a bright Sunday morning, it just clicked to me and I thought, why not. I will leave this for you all to figure it out. Please use the comments section to let me know how would you create this simulation in Xcelsius. I will definitely share the code, however I would like to see your approach first. Just to give you a hint, I’m using the color binding property that came along with the new SP3. Here is a blown up version of the same. Here is an Austrian version of Traffic Lights. Thanks to Jesse Aden. Here is a blown up version of the same. Xcelsius SP3 was a major release from SAP. It is by far the best Service pack SAP has ever released for Xcelsius. It’s like a breath of fresh air for all existing Xcelsius developers who were working with alternative workarounds to achieve a specific functionality that was not out of box prior to SP3. Although SP3 introduced a bunch of useful new components and features, there are few things that could have been better. One among them is Chart Data Labels. 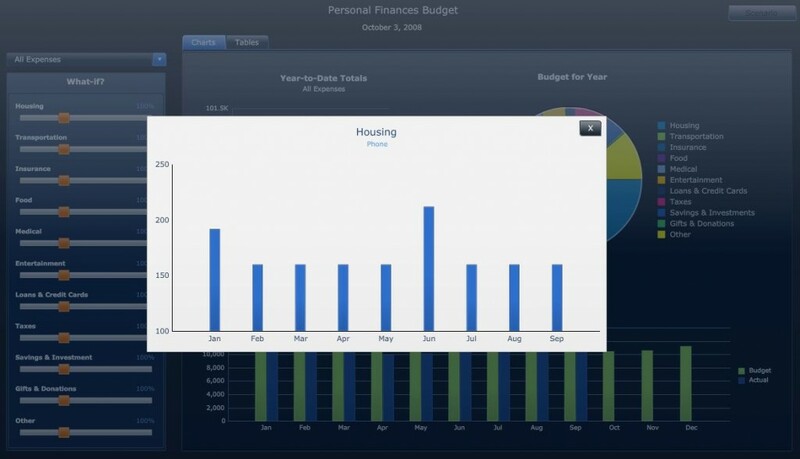 One of the major enhancements was with the Charting engine. Introduction of data labels was a great enhancement, however it is impractical without a fixed label size option. If you observe the below SWF, you will know what I’m talking about. Posted in: Charts, Service Packs. Ever wondered how to create pop ups in Xcelsius? Here is a short video that I recorded to demonstrate the same. I was able to achieve this using the Push Button component which is one of the new components that came along with Xcelsius SP3. Although it looks like a simple selector component , the Push Button can be very powerful when put to good use. Prior to SP3, this could have been possible with a toggle button, however it was an alternative approach rather than a straight forward one. Pop ups can be a great feature in Dashboards as you can save a lot of screen real estate and also shift the user focus when you want their attention to be drawn to a detail. Using pop ups you can make your dashboard even more interactive. Posted in: Tricks, Videos, Xcelsius 2008.